This is a hawk-eyed view on the exact information you need before choosing the best exterior caulk for windows, doors, wood trim, concrete, brick, hardiplank, rooftop, stucco, siding, sealing cracks and for many other outdoor caulking surfaces. Why you should read this article particularly? Is because I have reviewed some of the best paintable exterior caulk that will serve in a big for some specific homeowner who does want to cover up the caulk with a matching color to their home. So in a nutshell, the choice depends up to you as to go with the paintable one or not, the cure time of the specific caulk, colors you want, weather condition (Dry/Wet), durability, flexibility, versatility etc. If you are looking for a recommendation on exterior caulks, I am here to help you as I have demonstrated the top 10 exterior caulks with their specification in details. And after going through that, hope you would be able to pick one as your best match. How did I select these Top-Products? First of all, I made sure that these I am reviewing are exactly for outdoor/exterior caulking purposes. That’s the critical part as outdoor temperature and humidity are more random than what it would be in your bathroom or kitchen. There are options to choose from acrylic latex, silicone, butyl rubber, elastomeric or even solvent-based caulks. But In my choice of the exterior caulks for reviewing in this guide, I considered the caulks that are durable and can expand and contract without cracking. I also considered the versatility of use in terms of what others are saying about it. I tried to avoid the one that does not have the capacity to withstand harsh elements, and users are not happy with it. Lastly, these are weather resistant and ideal for exterior caulking. Stay with me and learn the top choice of exterior caulks of the year. The Sashco 10016 is commonly referred to as the Big Stretch. This is one of the caulks that is versatile and can be used for both exterior and interior applications. This works perfectly for sealing soffits, eaves, vents, siding, doors, and windows as well as baseboards, among others. For those who are looking for a solution for crown molding, then this would be a perfect choice as well. This one is made in the USA and has proven to be durable when applied appropriately. Besides the Big Stretch caulk is also great for soundproofing. Big Stretch comes in a 10.5-ounce tube and is 100% acrylic latex. That is why it has high elasticity, giving it room to stretch to up 500% without cracking. It forms quite a strong adhesion, as long as the environment permits. This is perfect for the light seals, where there is no heavy movement. It is easy to clean and cures in about 48 hours after application. Criticism: Might not be effective in areas where WATER FLOW occurs too often. That’s why not suitable for your rooftop as rainwater will affect the sealing and cause damage. Similarly, if you need to caulk areas that have a high level of traffic like – swimming pools, sidewalks, patios, and driveways, this is not the right caulk to use as it will not hold. The DAP 18128 is a premium quality caulk, which is a combination of silicone and acrylic latex. It comes with exceptional adhesion that it is durable and highly flexible and I loved the overall quality of this product. This can be used for both interior and exterior caulking and will work effectively. With a guarantee of 35 years, you can tell of the strength of this caulk and its long-lasting traits as an exterior paintable caulk. After the application of the DAP – Alex plus, it forms a great seal. The caulk, when fully cured, is mildew resistant, which makes it ideal for the home exteriors. It is easy to clean up with water and when applied, it can be painted in 30 minutes. This is a multipurpose caulk and tends to surpass the expectations of the users. Like the first one, this is also made in the USA and it is perfect for exterior caulking as it has the ability to resist moisture and extreme weather conditions. It is available in a 5.5 oz. package size and 5.6 ounces in weight. The ability to absorb and dry very fast is what makes it convenient for quick repairs. Criticism: To talk about the cons, I have found that some people referred to this one as a little too MOIST. Also, takes a bit more time to dry and doesn’t stick perfectly when WET or CLUMPED, as compared to some other caulks. The DAP Self-Leveling Concrete 3.0 comes with an advanced formula of the KWIK Dry Technology. This has become a great exterior sealant that can be used in masonry and concrete applications. The superior technology allows it to be exposed to moisture and water in just 3 hours, without being washed out. This is far much better than the silicone or latex caulks and sealants that need up to 48 hours to cure. The DAP Self-Leveling is perfect for caulking horizontal cracks, like patios, garage floors, concrete driveways as well as other concrete surfaces. For all the concrete repairs, this one is the best choice of exterior caulk to use. You will be able to cover 49 linear feet with a 3/16 inch diameter bead. This forms a durable bond and is able to withstand heavy traffic and can be applied in all weather conditions. The fact that it is a motor sealant means that you will not need to use any special tools for application. The DAP Self-Leveling caulk does not crack or even shrink under any circumstances besides being paintable and easy to clean with water. It is quite flexible and is the best choice when you want a permanent seal that is waterproof. It comes as a low odor caulk and is compliant with VOC. With this, you can be sure of an exceptional adhesion that stays intact for a long time. Criticism: Excellent features expect it does not provide various colors to choose from. This caulk might not be self-leveling if you are not applying in the APPROPRIATE MANNER and you have to use a caulk finishing tool to smoothen the caulk bead. Dap 18110 is an easy to clean acrylic latex caulk with silicone. This is why it passes as a premium quality caulk, which can be used on ceramic, stone, wood, brick, glass and metal. The key benefit is the fact that it will create a permanent seal being highly durable and flexible. It will easily expand and stretch without cracking, besides serving as caulk for both interior and exterior projects. You can make use of this caulk on door and window frames as well. It has also been established to be a great choice when you need to caulk corner joints. Once the caulk is fully cured, it will give you excellent adhesion, which is resistant to moisture and mildew. This comes in 10 different colors to choose from and you might find one that matches the color of your caulking area. It dries and absorbs fast that makes it 30 minutes paint ready. Being a 35 years durable exterior caulk, this can be a great choice of the homeowners to use as a sealant, adhesive, and caulk that is watertight and exceeds the ASTM specification C 834. Criticism: Although it is leveled as it can be used for interior and exterior caulking projects, but I recommend you SHOULD NOT USE this for interiors like caulking around your bathroom. Because some people said, it disintegrates when exposed to frequent water submersion. GE Silicone 2+ is a white color caulk, known as a highly durable and flexible to use around your windows and doors. This is an easy to use and non-paintable exterior sealant and caulk, made of 100% silicone and comes with a 10.1 Oz. Tube. It will be useful in creating a permanent waterproof and weatherproof seal to fill in the gaps and cracks in trims, siding, doors, windows, as well as materials like brick, mortar etc. Once a surface is caulked, it can be exposed to harsh weather and moisture and it will not be affected. Besides, this caulk doesn’t discolor metal finishes which makes it a perfect choice for exterior caulking projects. The special formulation of this Caulk makes it highly resistant to mildew and mold growth for about 10 years. And being a premium quality caulk, it will cure pretty fast that is rain ready in just about 30 minutes. Criticism: For some users, it might be hard to squeeze the caulk out and MIGHT NEED to use a caulking gun. DAP 18275 DYNAFLEX 230 is a 100% waterproof and paintable sealant for the exterior window, siding, door, and trim etc. The silicone tough latex formulation is what gives it an outstanding exterior performance. This has been made in such a manner that it gives the best flexibility, without cracking. And it is a sealant that will withstand contraction and expansion without breaking or losing its seal and thus being 100% watertight. Moreover, it has the capability to conveniently feel gaps of up to 1 inch wide and when cured, it is fully resistant to mildew and mold. This is also one of the paintable exterior caulk that is quite durable, making it a suitable choice for various exterior uses. In fact, it can create adhesion on a number of building materials including PVC, wood, MDF, composite trim board and polystyrene among others. This is the perfect combination of durability and flexibility and has a low odor of latex. As far as the application goes, it is easy to dispense with a caulk gun. The bead will be smooth and presentable. With a 50-year durability guarantee, this superior quality caulk provides permanent adhesion. Besides, it meets the federal specification and ASTM Specification. Criticism: Make sure you have chosen the RIGHT COLOR you need before ordering. Besides, read the back panel carefully to avoid eye & skin IRRITATION. One thing that stands out with the GE Silicone II caulk is the fact that it will be ready for rainwater in 3 hours. This means that after just 3 hours of drying, it will not be washed away by water. This is why it would be ideal for exterior caulking especially in areas with continuous water submersion. Like the GE Silicone I, GE Silicone II is also 100% silicone caulk that has quite fast adhesion that gives it flexibility and durability. Cured time is super reasonable (3 hours) and if you are trying to squeeze your schedule for some maintenance, then this would be the best exterior caulk to use as it is quite convenient. As you might know, the exterior caulk needs to be effective and have the ability to withstand harsh weather conditions. And so, it is made to be sun and freeze-proof as such, it does not crack or break even when exposed to extreme weather conditions. When applied, there will be no gaps for water and air to seep through. There would be no water damage or growth of mold in your home as the silicone caulk will create a permanent seal. This product is made in the USA, which is an assurance of quality and durability. In fine, it is a shrink-proof, crack-proof caulk that is definitely worthy of using for all your exterior caulking projects. Criticism: Uncured and might CAUSE IRRITATION, make sure you read the back panel for precaution. Also, I recommend you should no use this in a place getting high FOOT TRAFFIC. The GE Silicone 2+ is a non-paintable metallic gray color caulk that is a suitable solution for all the exterior projects. It is 100% weather and waterproof and highly recommended for metal projects. This product can be used as a sealant, adhesive and caulk simultaneously. It works well with metal surfaces, although it can produce better results with other surfaces being multi-purposive. You can also use on – trailers, metal roof, bricks, vents and pipes as well as sheds. GE Silicone 2+ can be applied on both wet and dry surfaces and have a permanent seal. It takes just 30 minutes to settle and dry and therefore it can be exposed to rain in just about half an hour. It takes about 24 hours to cure completely and when this happens, it hardly cracks or shrinks. It is quite flexible and even when exposed to extreme weather conditions like UV rays and freezing temperatures, it will remain intact. This is a long lasting option to protect your home. Besides, this one is neutral curing caulk and adheres to a wide range of surfaces like – aluminum, wood, stainless steel, vinyl siding, asphalt, granite, masonry, metals, concrete, stucco, glass, and plastic. It is great to use for various projects and will not degrade under harsh climates. The caulk is guaranteed to produce great results as it exceeds the ASTM specifications. And so when used, be sure that the gaps are sealed permanently, which prevents any water seeping or air leakage through. Criticism: DON’T PAINT over as it will not hold. But I guess you won’t be painting as this product is a bit more specific for exterior metallic surfaces along with some others. The DAP Phenoseal is a versatile and all-purpose adhesive caulk that comes as a translucent & white vinyl. Can be used for exterior caulking projects for sealing gaps as this will allow painting over if you want to cover up and hide the caulk. It creates a strong bond as an adhesive and the advantage is that this will expand and contract accordingly to be able to seal up joints of up to ¼ inches. And you might consider as a suitable and effective caulk for all type of exterior works. When used correctly, the DAP Phenoseal will prevent any air or water from penetrating through the gaps or cracks and becomes mildew and mold resistant. Besides, it works efficiently for indoor purposes that it has fast-drying interior and exterior formula that will clean out easily with water and soap. And you can easily paint over with oil based paint or latex. This will conceal any area that has been caulked, making it ideal for various applications. It is specially formulated to bind with most common materials in buildings. Your building will be protected as it will resist moisture that causes the growth of harmful mold. The dry time is 30 minutes and after this is can be exposed to water and it will not wash away. It comes with a very low VOC content, which explains the lack of odor in this caulk. Criticism: Couldn’t find any cons so far and you might READ the back panel for warnings. Hydroment color matched caulk is a siliconized acrylic that comes with a unique rough texture. This is made to match the Hydroment sanded grout and is best for caulking walls and floors that are made with sanded grout. It is a versatile option as it can be used for various applications and will form a perfect and permanent bond. When applied, it dries quite fast as it can be touched in approximately 1 hour. This one is available in about 14 different colors and so you have the advantage of choosing the one that matches your caulking area. So before you buy one, be careful that you have chosen the right color. This meets the ASTM C834 standards, which is an assurance of quality. When it is fully cured, this caulk adhesive is UV, moisture and mildew resistant. This will be used for both interior and exterior application. It is available in a 10.3oz tube and with a single tube, you can cover an area of 25 linear feet. The Hydroment Color Matched Caulk is washable, easy to remove and can be painted, easily. The rough texture is a unique character that it carries and the tube will work with a standard caulk gun. Criticism: The only issue is that it takes up to 3-5 days to cure in low moisture setting, which may not be favorable for THOSE IN HURRY. It is important to REMEMBER that the caulk is colored and you would need to find the specific color that works for you. How to Make Exterior Caulk Long Lasting? Well, the basic fundamentals are the same for both exterior and interior caulking. But to make the exterior caulk long lasting, one needs to pay some extra attention as exterior weather condition changes randomly in compared to interior weather of your home. Consider using acrylic caulks for most outdoor tasks. 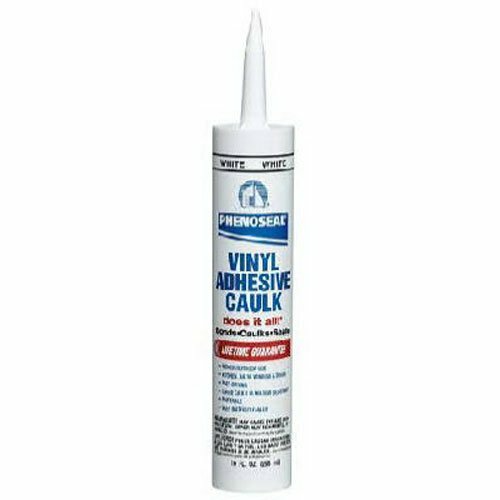 These are easy to use and durable caulk that has so many benefits. The fact that it provides great adhesion and flexibility means that it should be a great choice for exterior caulking. If your sole consideration is the performance of the caulk, then it would be better to go for polyurethane. This will stick better and maintains flexibility than acrylic caulk. The unfortunate bit is the fact that it does not apply neatly and it is difficult to smooth out and tougher to clean. But for wider gaps, this would be the best exterior caulk to use around your windows, doors, wood trim, brick, rooftop etc. It is important to start by cleaning the surface before the caulking process. It will be very difficult for the caulk to hold well on a dirty surface. To ensure that the exterior caulk lasts longer, make sure that the caulking surface is cleaned properly. Primer works perfectly on wood-based surfaces and will provide excellent bonding. So before caulking, you should apply primer to the wood surface. But do not fill the gaps with the primer entirely. This will extend the life of the exterior caulk. To smoothen and get rid of the lumpy surface of the caulk bead and have a permanent seal, use a professional caulk bead tool like all way caulking tool. This will not only shape the bead but also withstands the movement of caulk. Foam backer rod can extend the life of your exterior caulk joint. Stuff it into the gaps before caulking and this will enhance the seal. The backer rod is highly recommended for any gaps that are more than ¼ inches wide. Any gap can continue to grow wider or narrower, and this movement will affect the caulk. If a gap is to expand, it means that it will stretch the caulk. The baker rod lets you put the caulk in an hourglass shape which is one sure way to ensure that the caulk does not tear when stretched. This it will last for a very long time. Self-leveling caulk would be the perfect choice among others and you would be able to get a perfect caulk bead on horizontal surfaces. Make sure you put in the backer rod if the gap is wider or deeper. Otherwise, you will have to put in extra caulk to fill in the entire gap with caulks, which is a complete waste of money. Exterior caulking is an interesting process, with its fair set of challenges. Most people are forced to keep repeating exterior caulking which is caused by poor caulking, in most cases. Make it a habit to tape before caulking, as this will help to control the caulk lines and get it exactly in place. Once you apply the caulk and smooth it using your finger or caulking tool, eliminate the tape immediately. There is a wide selection of caulking products on the market. First, consider the weather consider, water submersion rate, foot traffic of the exterior caulking surface and then buy one that suits you best. Such as, Polyurethane is the best for doors, windows, and siding as it is paintable and never shrinks. And for interior trim latex would be the best and silicone caulk for bath and kitchen. Some caulk tube might be a bit hard to squeeze and get a perfect caulk bead. Hence make sure you use a caulk gun whether it is to be manual or, battery powered. These are very handy and useful if you want to finish up professionally. And thus get a WOW from others. Do not try to pull the caulk but instead, you should push it into the cracks. This will increase the effectiveness of the caulk as it will adhere to surfaces well. Always apply the caulk on the smooth surface to avoid humps on the bead. Cutting the caulk tip straight will allow you to swivel the gun away from obstacles without a problem. Move your upper body or even your legs when caulking. Do not use your wrists as this may cause injuries and you will not be able to get a straight caulk bead. If you have a long bead running, it is impossible to do with a single shot. But in case if you pause, do not start where the bead ends. Instead, start at the opposite end. This is a great way to prevent globs. Anytime you have the caulk unused, there is a plug that automatically forms. To remove this plug effectively, use a screw and thread it into the spout. There is a common mistake of cutting off the caulk tube tip too much. This ends up leaving a large hole of the caulk tube and results in an excessive squeeze which is a waste. Always cut the tip accordingly and you might read the user manual to get an idea. In most cases, a hole that is 1/6 inches will just work fine. This is an obvious thing to look for and you will win. So, how long do you wish to have the project last? I am sure, definitely not for a few months. Cause, caulking your home surroundings is easy but time talking and you might not want to do those same things on a frequent basis while leaving your office and other important tasks. Hence, the longevity of the project is one of the key considerations when shopping for exterior caulks. There are different types of caulk products that will be ideal for different materials. It is essential to consider the surface as this is the only way that you would end up with the right one. It is important because one of the reasons why caulking may fail is when the caulk does not adhere to a particular surface. It is imperative to always consider the size of the gap. Ideally, caulk is meant for small cracks and gaps. If you have very large cracks, additionally you might need to buy some baker rods. Determining the size of the crack will help you identify the right quantity to buy. The other essential consideration when it comes to exterior caulks is the specific type. The common ones are silicone, acrylic latex, and polyurethane. Acrylic latex is considered to be the most versatile caulk and it is easy to use. The application is easy and has a long life, not to mention increased flexibility. However, in terms of performance, the polyurethane is known to be of exceptional quality. So, the type of project will determine what works for you. Last, but not least, it is imperative to consider the amount of time that it takes to dry and cure. There are some instant caulks that will dry-to-touch in less than 30 minutes, while others might take up to 72 hours. The curing time for most of them is 24 hours, but some special ones will take up to 5 days to cure completely. It is advisable to choose the one that will serve your needs effectively. At some points, you might consider painting over the caulk and match it to the surrounding color. In this case, make sure you have brought the paintable caulk instead of the non-paintable ones. As you have seen, there are different types of caulks on the market. While the general use may appear to be the same, you will realize that the success of the sealing process is in choosing the right caulk. That’s it for today and I hope you have learned something new from this article. If you have enjoyed this, I would request you to share this with your friends and colleagues who are in search of this exact same information. Question-1: Does all exterior caulk allow painting over it? Answer: No, all exterior caulks are not paintable. However, you should easily be able to find caulks that are paintable. In order to paint, it is advisable to allow the caulk to dry and cure before painting. Question-2: What temperature can silicone caulk withstand? Answer: There are high silicone sealants that have the capacity to withstand temperatures of up to 600 degrees Fahrenheit. These are known to be resistant to vibrations, shock, and aging. Question-3: How long does it take for 100% silicone to dry? Answer: The amount of time that 100% silicone caulk takes to dry may vary, depending on the brand. However, most of the quality brands will take about 24 hours to fully cure, but the humidity level of the atmosphere may affect this time. Question-4: Can silicone caulk be used outside? How long does it last? Answer: Yes, silicone caulk can be used outside to seal cracks and gaps. When the caulking is done in the right way, it should last for at least 20 years, as it is permanent and durable. Question-5: What temperature can you caulk outside? Answer: You can caulk, successfully at temperatures that are below 40 degrees F. However, when the temperatures are below 30 degrees F, the curing may not be perfect and this may affect the joint. Question-6: Can you caulk outside in the rain? Answer: In case of an emergency, you can caulk in the rain. However, caulk does not adhere well to wet surfaces and as such, it may be washed away easily. Caulking in the rain should be a temporary solution. Question-7: How long does it take exterior caulk to dry? Answer: Exterior caulk will take up to 24 hours to dry. However, this will depend on the type of caulk that you are using. There are some that are said to take less than an hour to dry. Question-8: What kind of caulk do I use for concrete? Answer: The acrylic latex silicone caulk would be the best option to use on concrete. This is said to be durable and will last up to 25 years. The silicone element in it will allow it to expand and shrink without cracking, as it is quite flexible. Besides, it will withstand moisture and extreme temperatures. Question-9: What is the basic difference between caulk and sealant? Answer: The key difference between caulk and sealant is the elasticity. Sealants are, mainly made of flexible material like silicone, which makes them ideal for areas that are vulnerable to expansion and contraction. On the other hand, caulk becomes relatively rigid, when it dries and it is best to use in areas with the least movement of the cracks. Question-10: What kind of caulk do you use for the rooftop? Answer: The most appropriate caulk to use for rooftop would be the one made of silicone and Urethane. These are elements that are commonly used in roofing materials and as such, they would be the best for the rooftop. Question-11: Why does caulk crack when painted? Answer: There are a couple of reasons for the caulk to crack when it is painted. One common reason is the use of the low-quality caulk and when there is expansion it tends to crack. When the caulk does not resist moisture, as well, it will crack when it is painted.